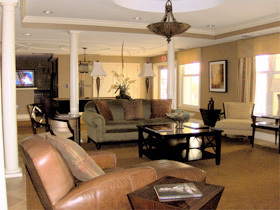 The art deco style of furnishings in the spacious hallways and common areas give the building a warm and fun feeling. The interior is beautifully designed and decorated to make every space seem individual. The shared living area is particularly spirited and features a caterers- kitchen, private card-playing nook and large pool table. Amenities include a pool, a fitness room with sauna, a meeting/living area, a courtyard garden, elevators, a security system and an enclosed parking garage under the building.